Apple became the first* company worth $1 trillion on August 2, 2018. That’s an incredible number, isn’t it? Forget a trillion dollars; most of us would simply love to be millionaires. That’s not too much to ask, right? There are 36 million millionaires in the world today, and about 15.4 million of them live in the United States. That’s roughly as many people as the combined populations of New York City, Chicago and Los Angeles. If every one of those American millionaires got together to take Apple private, they could do it, if each of them spent about $65,000 to buy Apple’s shares. No big deal, it’s just asking the combined population of America’s three largest cities to each chip in a bit more investment capital per person than the average American household earns in a year. Some of those millionaires might have even made their fortunes by buying Apple stock some years ago. 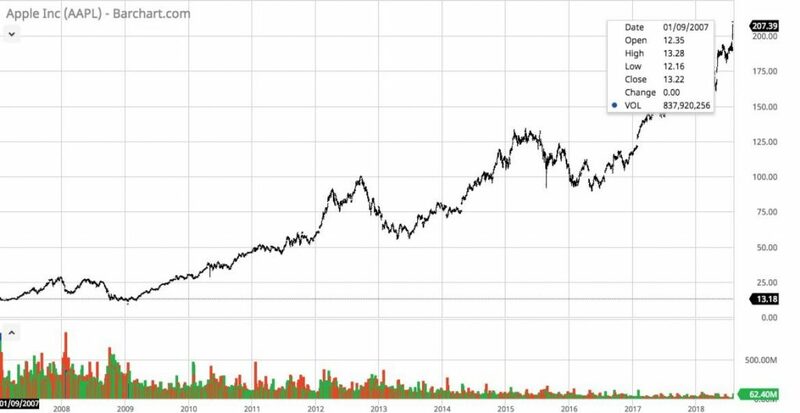 If you’d bought $65,000 worth of Apple stock on January 9, 2007, the day Steve Jobs announced the launch of the first iPhone, you’d have wound up with shares worth $1,137,509 (if you’d reinvested all dividends) when Apple hit the trillion-dollar mark. That’s a pretty impressive return, but some Apple purists would point out that you really should have invested when Apple first went public in 1980. You would have made a lot more money off your investment, but you would’ve had to wait a lot longer to get there. What I found while researching this subject is that the pace of Apple’s value creation has actually accelerated as you get closer to the present and the big 13-figure milestone. It’s pretty clear that the iPhone has been the biggest single driver of Apple’s growth over the past decade-plus. In fact, the average selling price of an iPhone, which was most recently $724 in Apple’s June quarter, is very close to the number you get when you divide the 1.42 billion iPhones Apple’s sold since 2007 by Apple’s trillion-dollar market cap: $704.23. One truly amazing thing about that number is that a large number of those iPhones are still in use today. Earlier this year, Apple reported that it had 1.3 billion active devices, which means that the market valued Apple at $769.23 per active device when it hit the trillion-dollar mark. Even if you subtract 400 million iPads and other devices from that number, you still come away with the reality that nearly two-thirds of all iPhones ever sold are still in use right now. What happened to the two-year replacement cycle? If Apple’s active devices were represented as the size of its user base, Apple users would be the fourth-largest digital community in the world, behind Facebook (2.23 billion monthly active users or MAUs), Google’s YouTube (1.9 billion MAUs), and Facebook-owned WhatsApp (1.5 billion MAUs). Its population would also be larger than that of any country except for China and India. Size isn’t everything, though. Remember how I calculated that each active device was worth $769.23 of Apple’s market cap? How does that stack up against the other tech titans on this list? How much is a user worth to Facebook, YouTube and WhatsApp? It’s somewhat surprising to see that Facebook’s valued so highly per active user, but it’s much less surprising that Apple’s user base is worth several times more per person, given that an Apple user is likely to fork over hundreds of dollars to become part of the tribe. You can’t credit Steve Jobs with all this growth. Granted, Jobs was the driving force behind the iPhone’s development, but he had a lot of help from Tim Cook, whose operational expertise helped Apple build one of the world’s best and most efficient manufacturing supply chains. Apple was worth $75 billion on the day of the iPhone announcement and $321 billion when Tim Cook took over as CEO from an ailing Steve Jobs on August 24, 2011. By that assessment, Steve Jobs created about $318 billion in market value (Apple was worth about $2.8 billion when Jobs returned as interim CEO in 1997), and Tim Cook created about $679 billion, more than twice as much as Steve Jobs. The difference between Apple without Tim Cook and Apple with Tim Cook is pretty easy to see. Just go back to the 1980s and 1990s, when Apple went from innovator to also-ran as competitors built cheaper computers that offered more functionality to a wider range of people. Even if Apple decided not to buy any other companies, it could still combine its available capital with its annual free cash flow to buy itself in about 12 and a half years. Over the past year, Apple has generated $58.6 billion in free cash flow, which is the money left over from its operations after accounting for the purchases of heavy equipment and real estate and other things of that nature. To put that in perspective, only ten people in the entire world are worth more than $58.6 billion, and it took them a lot longer than one calendar year to get there. 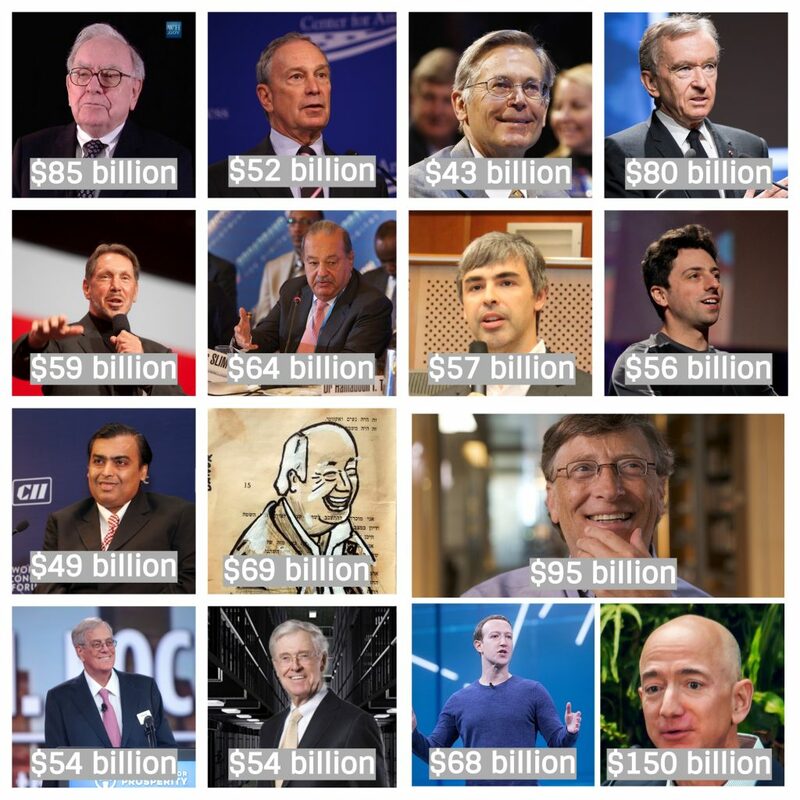 In fact, Apple’s currently worth more than the 15 richest people on the planet put together. That includes Jeff Bezos, Bill Gates, Mark Zuckerberg, Warren Buffett, Larry Ellison, Sergey Brin, Larry Page, and a bunch of other old white guys. 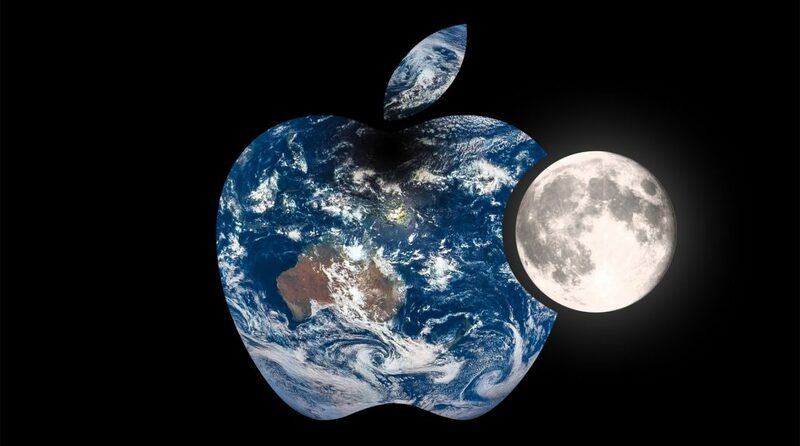 Not only is Apple worth more than those 15 guys put together, its market cap is also larger than the GDP of 172 countries.It’s also worth more than the combined GDP of the 95 lowest-GDP countries in the world. What else is Apple worth more than, at a $1 trillion valuation? What do you think? Is Apple worth $1 trillion? Should it be worth even more? We’ll find out what the stock market thinks about these questions soon enough. *Remember the asterisk from way back at the beginning of this article? Just like Barry Bonds’ home run record, this milestone has a “but” attached. Apple isn’t the first company to reach a trillion-dollar market capitalization, it’s just the first American company to do so. The first “trillion-dollar company” was PetroChina, which as its name might imply, is China’s largest oil and gas producer. PetroChina hit a peak valuation of $1.08 trillion on the Shanghai Stock Exchange on November 6, 2007, and has been dropping ever since. Apple was worth $133 billion on November 6, 2007, which means it added roughly $870 billion in market value from then to its trillion-dollar milestone. PetroChina’s market value on the day Apple crossed the trillion-dollar threshold was about $205 billion, which means that, in a little over a decade, PetroChina lost almost exactly the same amount of market value as Apple gained.